took 17 months to complete. Ireland’s largest hotel operator officially opened its latest hotel as Dublin starts to see more much-needed rooms coming on street. Maldron Hotel Kevin Street, (website) owned and operated by Dalata Hotel Group, opened its doors following a €26m investment which took approximately 17 months to complete. 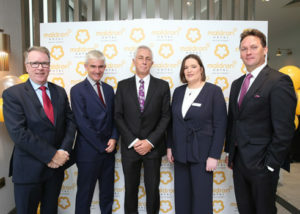 The 137-bedroom hotel was officially opened by Minister for Housing, Planning and Local Government, Eoghan Murphy, and John Hennessy, Chairman of Dalata Hotel Group PLC. Pat McCann, CEO of Dalata Hotel Group said, “As the Irish economy continues to grow, and with domestic and inbound tourism numbers expected to increase, our pipeline of rooms in both Dublin, and regional Ireland, means that we are well placed to cater for that growth.